Last week, the apprentice and I tackled the pork roulade. A roulade can be pretty much anything that is rolled up and filled with something yummy. I haven’t really made one of these since I was back in culinary school a looooong time ago (read: over five years). I thought it would be fun to try to teach something that I wasn’t already a pro making. 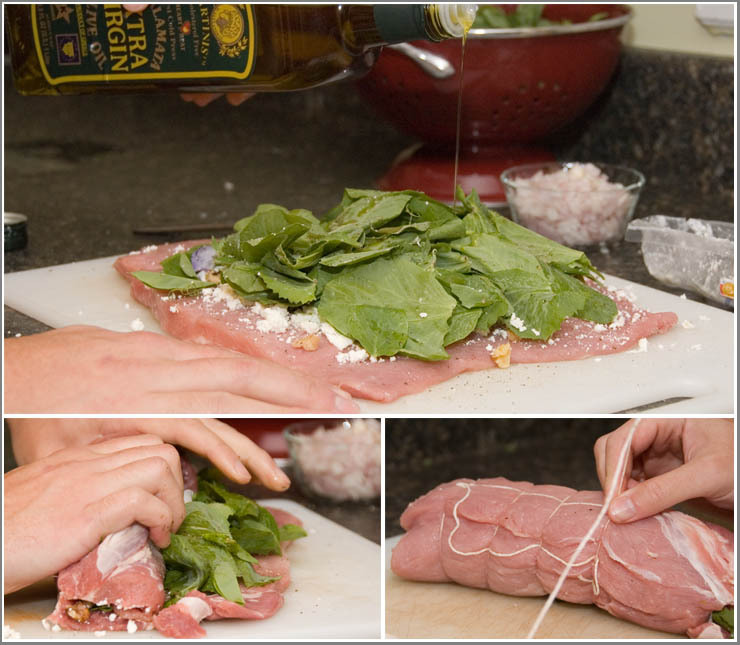 In this instance, we used a pork roast loin and filled it with pea greens, goat cheese, and walnuts. The pork was pan seared on all sides and then roasted in a hot oven until just cooked through. 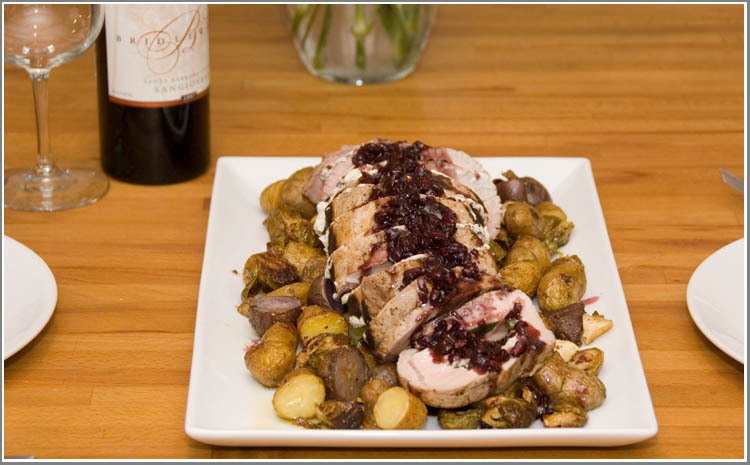 We topped off the pork with a pomegranate reduction; the sweet, tart pomegranate matched very well with the savory pork. We finished the dish with roasted fingerling potatoes. This dish was a bit more intricate than the last one but it still wasn’t all that difficult to make. The hardest part of the dish is preparing the pork for stuffing; if my directions don’t work for you, there are plenty of tutorials out there to help you. To prepare the roast for the roulade, it needs to be butterfly cut four times. The pork will basically be cut and unrolled, much like a carpet is unrolled. Cut the long side of the pork about 1/4 of the way from the bottom all the way through until you get to about 1/2 inch from the end. Roll the fat side of the meat off of the new thin slice. Repeat two more times, starting your next cut where you left the previous cut attached.. The pork should now be about four times as wide as it was and only a quarter of the thickness. Cover the meat with plastic wrap and pound flat with a mallet or small frying pan. Try to get the meat to a uniform thickness. Spread the goat cheese all over the meat leaving a one inch border on the left side. Top with walnuts, salt and pepper, greens, and olive oil. Starting at the right side of the meat, roll tightly like a jelly roll. With the seam on the bottom, tie tightly with butchers twine. You can tie it any way you like just as long as everything stays tightly together. Run oil all over the outside of the roulade and season with salt and pepper. Sear all sides over high heat until a dark crust forms. When all sides are seared, move to an over-safe pan and cook for 25-40 minutes depending on how well you like your pork cooked. Return pan to heat and deglaze with pomegranate juice scraping any burnt bits off the bottom of the pan. Add shallots and honey and cook until reduced by half. Strain sauce into a clean saucepan and reheat. Whisk is butter one tablespoon at a time until the sauce coats the back of a spoon. 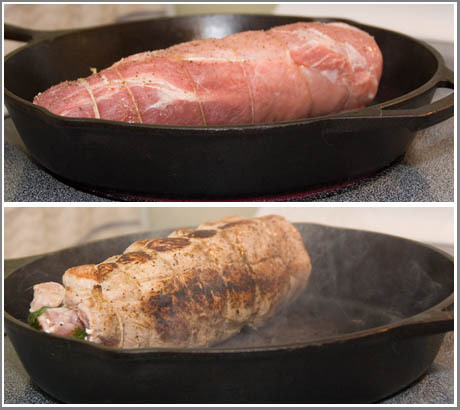 When pork reaches final doneness, remove from the oven, tent it with foil, and let it rest for ten minutes before slicing. Remove butcher’s twine and slice thinly. Serve with pomegranate sauce. I’ve invited the family to ours this xmas for a big dinner, so obviously the roast is pretty important! I found a tonne of recipes at this roast recipe site, but cant decide on one – there’s so many to choose from! It is fun planning such a big family dinner though! i admire those who made this…well im making my pork roulade…but i use different ingredients…but it came out with good texture and taste. Jon – Wow, talk about having the same thoughts, eh? Gouda and bells sounds good, too! Bob – I dig the blog. The menu isn’t all that different! Benny – pork = win! What a coincidence! I had not dropped in for a bit, and here I am looking at something I tried just last week. Except I used a thin layer of Speck for smokiness and fresh roasted red bells along with a goat gouda for the cheese (I like the greens idea though, gonna have to go with that next time). Used a citrus/guava reduction for my sauce. I’m like an apprentice without a journeyman, but I was still pretty happy with the outcome. p.s.- hope y’all are well. Tres bon! I love the pork. Great job on the site makeover. And the pork roulade looks deeeelicious!